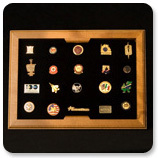 Lapel pins can be used by nearly any business as a way to elegantly promote their logo as well as any specific achievement or division. Mac Mannes has over four decades of experience in making sure that customers get exactly the lapel pin they need on time. Want to reward high achievers, commemorate an anniversary or simply show off your company's logo? Let us help you find exactly the right lapel pin. 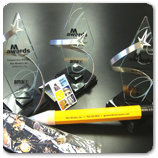 Mac Mannes, Inc. is the winner of the American Marketing Association M Awards in the Promotional Product category. This year it was for Giant “Pencil” for Mac Mannes; in 2008, it was “GW Map” for George Washington University; and, in 2007, it was “Bug Tie” for National Pest Management Association.